Walking into whichever store you purchase your body wash products from is no doubt overwhelming. There are about a million and one products to choose from, consisting of a range of ingredients, some of which you might not be able to pronounce. But you don’t have to choose. You can make goat’s milk soap at home and know exactly what’s going into your beauty product. Two local goat farmers, Shea Rolnick of Knotty Goat Soapery and Sonja Twombly of Lally Broch Farm, make goat’s milk to support their goat habits and say the benefits of making homemade soap lies in the abilities to know what’s going into the products you use. Plus, it’s fun. A boon to using goat’s milk for the base of the soap, as opposed to water, is that the milk is more easily absorbed into the skin because the fat molecules in the soap more closely resemble those found in human milk, Twombly said. It is important to note that when making soap, the ingredients must be measured by weight, not volume, so a scale is necessary for the process. To start the soapmaking process, combine the oils in a stainless steel pot. The pot must be stainless steel so a reaction does not occur when goat’s milk and lye mixture are added to the oils, Twombly said. While the oils are warming on the stovetop over medium heat, in the sink slowly add the lye into a bowl of frozen or very cold goat’s milk. The chemical reaction between the lye and the milk heats the mixture, so it is important to be stirring regularly so the milk doesn’t curdle. The goal is to get the temperature of both the oil mixture and the goat’s milk mixture to between 90 and 100 degrees, Twombly said, shutting off the stovetop before combining the mixtures. Once the mixtures are in that temperature range, and only 5 degrees or less apart, add the goat’s milk mixtures slowly to the oil mixture. This is where Twombly recommends that beginning soap makers take extra caution, using eye goggles and gloves, in case there is an abnormal reaction between the substances. However, Twombly says if the two mixtures are within the proper temperature range and you’re adding the goat’s milk mixture into the oils mixture, there should be no problems. Once the two mixtures are combined, the resulting product should be the consistency of melted butter. Twombly uses an electric emulsifier to blend the mixture, which takes about 10 minutes to get to the proper pudding-like consistency. However, if you do not have an emulsifier, the mixture can be stirred by hand, alternating five minutes of stirring and 15 minutes of rest for about 90 minutes. 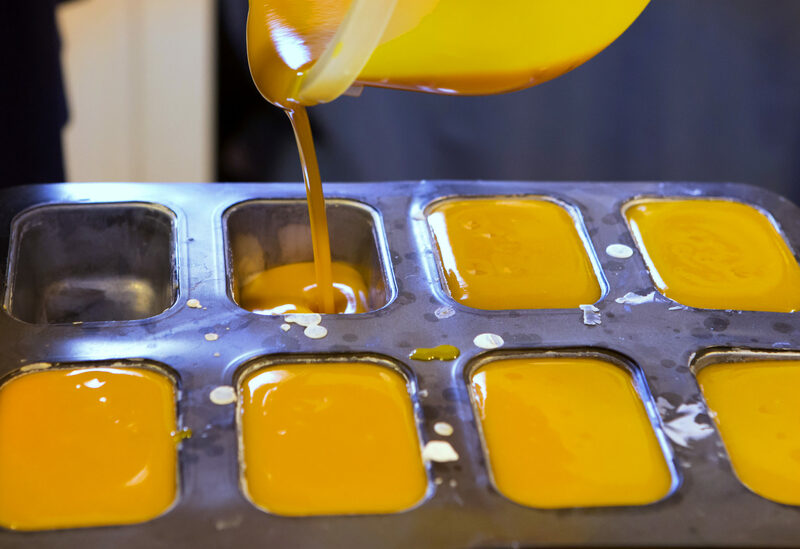 Once the soap mixture is the proper consistency, Twombly adds essential oils to give the soap a scent. Depending on how strong of a scent you would like the soap to have, the amount of essential oils should be adjusted. Since Twombly likes her bars of soaps to be exact, she uses a muffin tin to measure out the 5-ounce bars, pouring the mixture in individual muffin cups. However, if exact bars are not a concern for you, the mixture can be poured in loaf pans and sliced once the soap has hardened to the point where it can be turned out of the pan. Once the soap mixture is in the tins, it will sit at room temperature for 24 to 48 hours, before the partially cured soap can be turned out of the pans. At that point, the soap should continue to cure for four to six weeks, allowing the soap to thoroughly harden This ensures that the bars of soap will last longer once they are used with water.